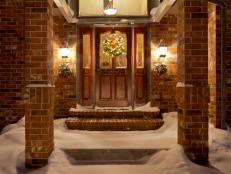 Almost every inch of your home requires some amount of maintenance, including your front door. Painted doors are prone to chipping over time, and can require touch-ups; however occasionally you may be ready for an entirely new look. In either case, set aside time — perhaps a weekend — to select a color, purchase supplies and complete the task. Also, note the time of year and the weather forecast. Clear, sunny days with reasonable temperatures — which are conducive to allowing paint to dry — are the ideal choice. 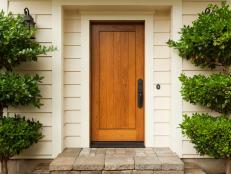 Taping paint chips to your existing door is one way to choose a color. If you have narrowed down the selections to two or three choices, you may also want to purchase small samples of paint to compare a larger swatch of the colors next to one another. Be sure to look at the swatches at different times of the day to see how the color changes as the light brightens and dims. 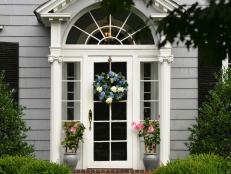 For a single exterior door that has been primed you’ll need approximately one quart of paint. If you do not have a glass or storm door that stands between your door and the elements, you’ll want to make certain you use exterior paint. 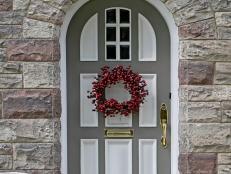 While you can choose any finish, glossy paints are typically preferred for doors and trim, because they stand out and highlight these architectural features. They also tend to stand up to nicks and scrapes better than flat or eggshell paint, meaning they could last longer. The most important thing to note is whether you have a latex- or oil-based paint. This is especially important for touchups, as you never want to paint oil over latex paint or vice versa. 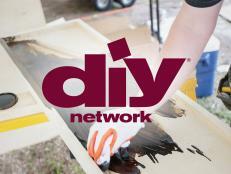 The type of primer you use also needs to match the type of paint you use (latex or oil-based). 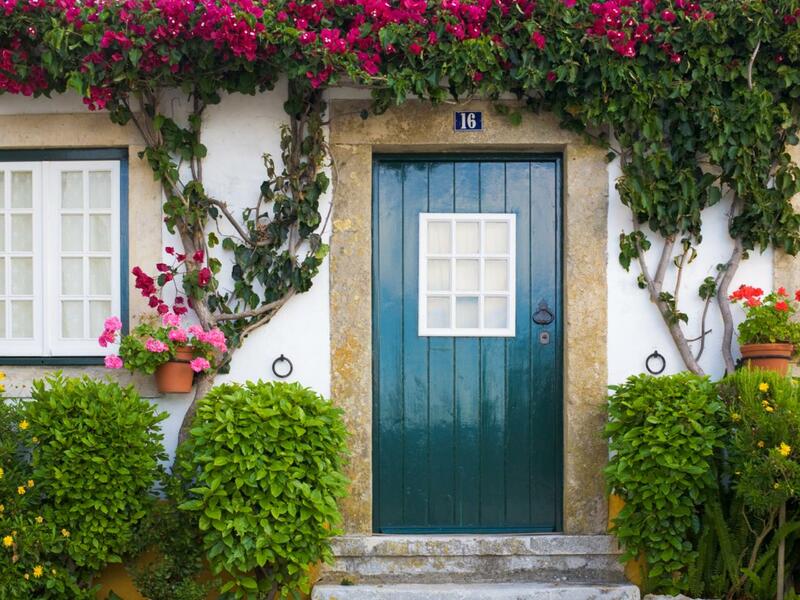 You can paint your door in place or remove it from the hinges if you have a storm or glass door to protect your home and keep bugs and debris from floating into your home. You can also tape a tarp over the opening if you prefer to remove your door to paint. As mentioned above, you’ll also want to prime the door before painting, if you are changing colors. 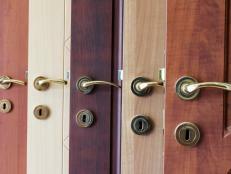 Whether you paint your door in place or on sawhorses, you will want to remove all the hardware. 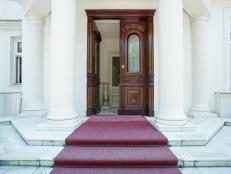 Secondly, you’ll want to clean the door with a wet rag, and then use a sander or sandpaper to remove any imperfections. Be sure to wipe away the dust from sanding before painting. Start by applying the primer. Cover the door completely. You can use a roller for this application. 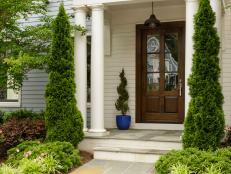 When the primer is dry, use a paintbrush to go over any trim work or details on the door. Next, it’s finally time to paint. You can use a low-nap or foam roller or a paintbrush for this. A paintbrush will give you a nice “hand-painted” look. Even if you use a roller, you can use a brush for the final coat to achieve this look. 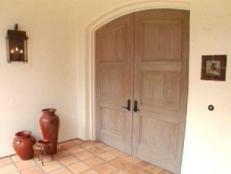 Allow the door to dry completely before reattaching the hardware and rehanging the door, if you removed it to paint. 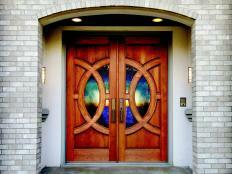 Learn the pros and cons of different types of entry doors, the various styles and latest trends.